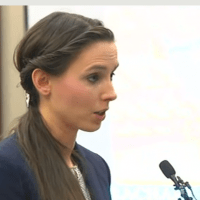 Rachel Denhollander spoke boldly about the depth of Nassar’s guilt. (Todd Pruitt – Mortification of Spin) I will not rehearse the grotesque acts of Larry Nasser. As you probably know by now, Nassar is the former USA Gymnastics and Michigan State University doctor whose crimes led to his disgraceful end. Today (January 24) he was sentenced to spend the rest of his life in prison. It is estimated that Nassar sexually assaulted over 150 women and girls. During the sentencing, Judge Rosemarie Aquilina gave some of those assaulted by Nassar an opportunity to address the court and the man who victimized them. Rachel Denhollander is the woman who first shone the light on Nassar’s deeds by recounting the abuse she suffered at his hands. Mrs. Denhollander’s statement in court was powerful. But it was much more than that. She gave a better presentation of law and gospel than you will hear in many evangelical churches. Mrs. Denhollander spoke boldly about the depth of Nassar’s guilt. Her words exposing his actions and the impact of those actions gave him no place to deflect his sin or in anyway minimize its impact. Extraordinarily, after methodically naming his evil she held forth the radical promise of God’s grace in Jesus Christ. I say “radical” because that is exactly how it sounds in light of Nassar’s wicked deeds. In all of this we are reminded that the gospel demands repentance. It is not a self-help program meant to make good people better. The gospel is not a nice word for nice people. It is a word of pardon for those devastated by their sin. It is a promise made to sin’s slaves that purchase has been won through the death of God’s Son. So great is the sinner’s guilt that nothing else would satisfy the demands of perfect justice.